This series consists of photographs originally created by others or from books, which Hubert Hollingworth re-photographed onto glass slide negatives. These were possibly used by Hollingworth for presentations on glass slides. The images cover a variety of subjects including religion and missionary work, farm animals, medical education, images of the reconstruction of England after WWII, First Nations people, the Canadian West including Saskatchewan, Vancouver and the Rocky Mountains, and Quebec. The majority of the religious images belonged to missionary Charles O. Bowen, a Welsh immigrant. The images consist of nature photographs, often mountain scenes with a biblical scripture or hymn transposed on them. Another contributor of the religious images was Miss Cork, a missionary who worked in Africa. Some of the medical education images can be attributed to professors from the University of Alberta including Dr. Evan Greene, Dr. Ralph Faust Shaner and Dr. Maxwell Mordecai Cantor. 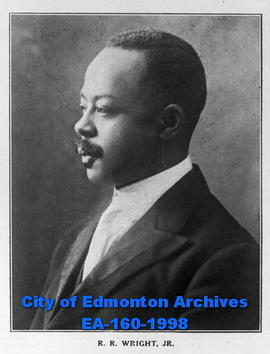 Dr. Evan Greene (1873-1966), a surgeon and anatomist, was one of Alberta’s earliest doctors. The subject of his slides is anatomy. Dr. Ralph Faust Shaner (1893-1976) was an anatomist, professor and head of the University of Alberta’s Department of Anatomy. His images represent many of the course that he taught such as histology, embryology and neuroanatomy. Dr. Maxwell Mordecai Cantor (1903-1981) was the provincial coroner and a biochemist at the University of Alberta. Dr. Cantor’s images are of the pathology of disease. The material was arranged according to the filing system of the creator and assigned item number(s) with the prefix EA-160 (EA-160-1983 to EA-160-3089). Many of the photographs are restricted to research purposes only and available only in the Reference Room..
Photographs up to 1948 – Public Domain. Photographs 1949 to 1988 are under copyright. See ‘Scope and Content’ above. Photographs have been described at the item level; most are available in the Reference Room and online database. However some of the medical education images are available only in the Reference Room.